But before he left, he covered an incredible amount of ground. My goodness, what can you say about Wally Glenn? Previous to being a founding member of the madness that was the Cirque de Flambé (1997-2002), he was a co-founder of the Pork Filled Players, a multi-cultural sketch comedy group which was in residence at the Northwest Asian American Theatre. Before that he co-founded OPM! and was a player/writer for the 11:07 project. In the Cirque de Flambé, most of his work happened behind the scenes. He was always inventing new fire effects, building pyrotechnics and finding new ways to make Fire Marshals across the United States and Canada shake their heads in disbelief. He could be seen on stage underneath flaming puppets, jumping burning ropes, but is best known for his role in the Cirque de Flambé as Pyro Boy, a role he created. 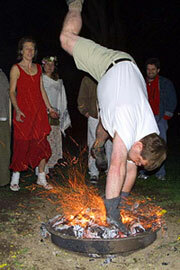 Wally continues to work as a fire artist pushing the boundaries of this new art form.